Happy Tuesday! I'm so excited about this Stampin' Up! style celebration!!! We're celebrating Stampin' Up! 's 25th anniversary all year along, but during the week of actual date (Oct. 25th to be exact) we thought we should pump up the party even more. So what better way than a sale on the very products that started it all: STAMPS, of course!!! 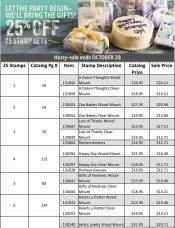 Offer: Get 25% off 25 stamp sets. Click on the flyer to see the list! Don't forget to check out this week's Weekly Deals!